For the first time in its history, the ITER Organization has established a formal path to technical collaboration with a non-Member state: Australia. On Friday 30 September, the ITER Organization signed a Cooperation Agreement with the Australian Nuclear Science and Technology Organisation (ANSTO), a national research organization representing the Australian nuclear fusion community for the purposes of the Agreement. 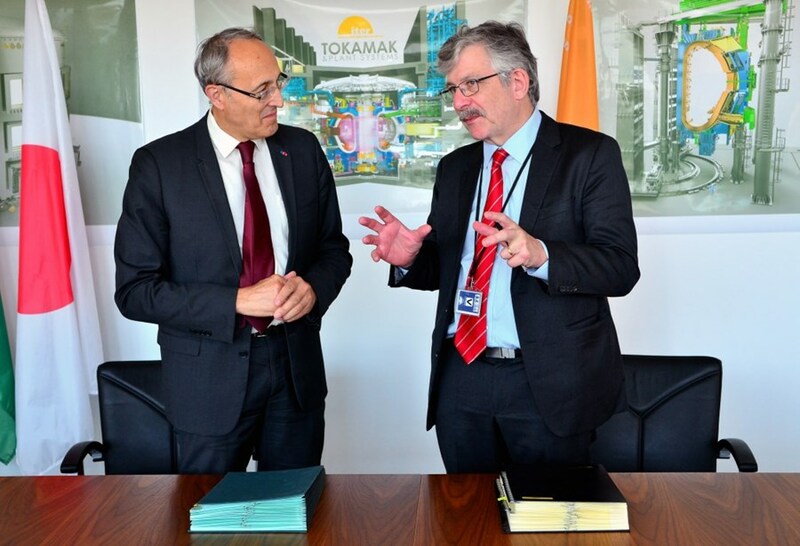 The Cooperation Agreement signed on 30 September marks a ''new model'' for engaging in ITER. Pictured: ITER Director-General Bernard Bigot (left) and ANSTO Chief Executive Officer Adi Paterson. For Australia's small but active community of fusion scientists and engineers, this formal welcome from the ITER Organization and the seven ITER Members to engage directly in the ITER Project is an achievement that has been a long time in the making. With a tradition of fusion research dating back a half century and well-established programs at universities and labs throughout the country, Australia has the technical means and human capital to contribute meaningfully to the ITER Project. For decades—both individually and grouped within the Australia ITER Forum—researchers have lobbied for closer involvement in ITER. Within the framework of the new agreement, it now becomes possible for Australia to contribute directly to the machine in small but important areas and for Australian researchers to participate in research collaborations at ITER. Cooperation is envisioned in a number of strategic areas, including diagnostics, materials, superconducting technology, and fusion plasma theory and modelling. "This a fundamental change," says David Campbell, who heads ITER's Science & Operations Department. "Although the fusion R&D activities in the ITER Members make up the vast majority of the international research program on fusion energy development, this is a first step in expanding our research collaborations into the wider fusion community, where there is significant, and in some cases unique, expertise. There is considerable potential for both the Australian and ITER fusion communities in such collaboration." ANSTO CEO Adi Paterson and John Howard, director of ANU's Plasma Research Laboratory, are pictured to the right of ITER Director-General Bigot. Also present for the signature were David Campbell (far left), head of ITER's Science & Operations Department; Eisuke Tada (second from left), ITER Deputy Director-General; and ITER scientific and legal staff who contributed to the preparation of the agreement and the development of collaborative activities. The chance for closer involvement in ITER came about when the fusion community encountered an advocate in Adi Paterson, the Chief Executive Officer of the Australian Nuclear Science and Technology Organisation (ANSTO). In agreeing to represent the Australian fusion community, this federal research organization is provoking a "multiplier effect," convening power at a federal level for universities and research institutes that are mostly based in the States. "It's an excellent fit for us," says the ANSTO Chief Executive Officer. "We're interested in strengthening international linkages ... we understand large scale projects ... we have been the custodian of Australia's relationship with CERN for years. Our experience will allow us to articulate for the government what the interest of ITER can be and act a translator and portal for our research communities." "This Cooperation Agreement gives our efforts in Australia a little more credibility and may help us to build up the program in the future," agrees John Howard, who heads the Australian National University's Plasma Research Laboratory and its H-1 research facility. "We have a number of small plasma devices in Australia that have helped us to develop technologies that are relevant for ITER and to train a generation of students. I foresee real mutual benefit—new opportunities for our graduates and the possibility for ITER to tap into a pool of really outstanding people." 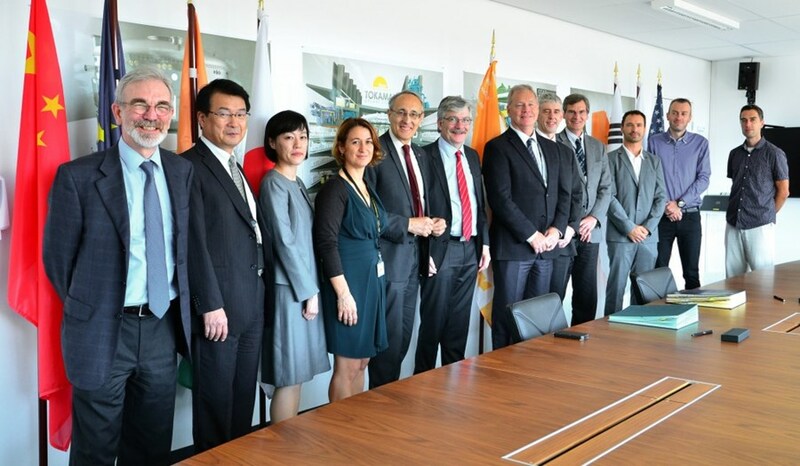 At the signature ceremony, the ITER Director-General Bernard Bigot celebrated a "new model of engagement that is fully compliant with the ITER Agreement"—a way of participating in ITER outside of full membership. "We look forward to Australia contributing solutions directly to our machine in small but important domains." *The Australian Nuclear Science and Technology Organisation (ANSTO) is a public research organization that pursues advanced applications of nuclear science and technology for the benefit of the public and industry. See more on the ANSTO website. Click here for the official recording of the Australian Parliament session during which ANSTO CEO Adi Paterson reported on the agreement with ITER (Senate Economics Legislation Committee, 20 October, 15:07:00).